Detective Josh Kyle examines a rifle brought in during a gun buy-back at the New Haven Police Academy in New Haven on December 16, 2017. On Dec.16, New Haven Police held a gun buy-back at the Police Academy on Sherman Parkway. Like previous buy-backs, it was organized in partnership with the Injury Free Coalition for Kids of New Haven, the Yale New Haven Children’s Hospital Injury Prevention Program and the Newtown Foundation. Saturday was National Gun Buyback Day and buybacks were held not only in New Haven but in Boston, Providence, Worcester, Hartford and other cities and towns in the northeast. The buyback provided American Express and/or Stop & Shop gift cards to those who turned in any working firearm. Those turning in a firearm received $200 in gift cards for an assault weapon, $100 for a pistol or revolver handgun, $50 for a rifle or shotgun, and $25 for a single or double-shot handgun. The New Haven police reported that 138 guns were turned in, more than in any previous buyback and precisely 100 more than were taken in by the Hartford buy-back the same day. Included in the 138 firearms were 74 handguns, 60 rifles and shotguns, and two assault weapons. Over the past five years, a total of 700 weapons have been brought in to the New Haven buy-backs. Some argue that buy-back programs are ineffective and don’t reduce the aggregate amount of gun violence. There’s of course no way to prove they do reduce gun violence since it’s impossible to prove that a gun that was turned in would otherwise have been used in a shooting. But what can be said is that buybacks remove guns from possible circulation and in so doing may prevent a shooting — perhaps a fatal shooting — at some future time. Guns brought in for a buy-back at the New Haven Police Academy in New Haven are catalogued on December 16, 2017. 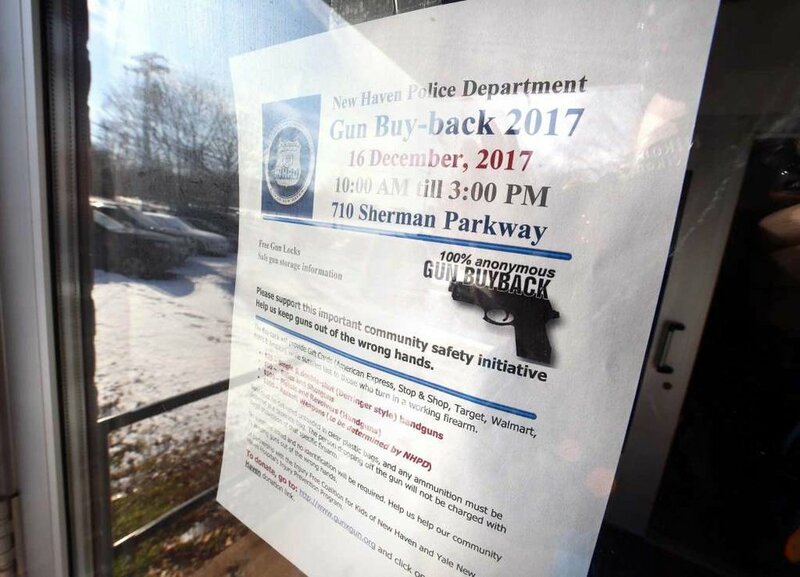 A sign advertises a gun buy-back at the New Haven Police Academy in New Haven on December 16, 2017. Sgt. Charlette Barham (left) and Detective Josh Kyle (right) catalogue rifles brought in during a gun buy-back at the New Haven Police Academy in New Haven on December 16, 2017.